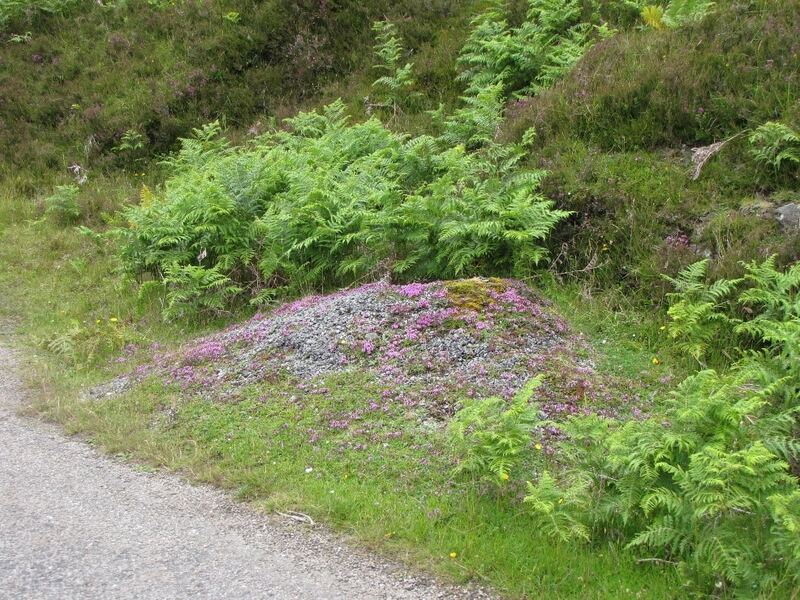 Roadsides occupy only a small part of the landscape of Assynt, but they support a diversity of wild flowers out of all proportion to their total area, and can be very colourful. I was reminded of this recently, when driving along the B869 just east of Glenleraig. A vivid patch of rose-purple caught my eye and after pulling in a little further on I walked back to check it out. 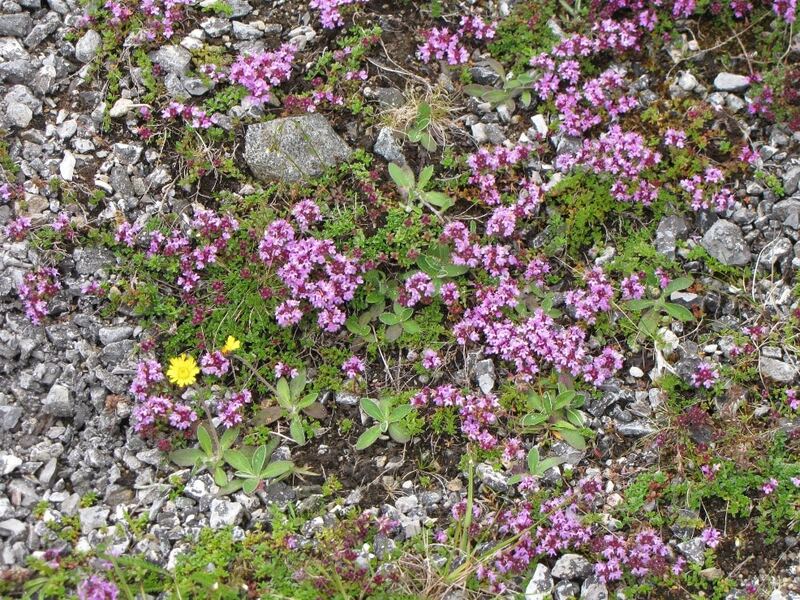 A discarded heap of tarmac had been colonised over many years by wild thyme Thymus polytrichus, which was in full flower. This small perennial related to dead-nettles occurs throughout the parish, from the coast to high in the hills, in short vegetation on light soils, especially where these are base-enriched. 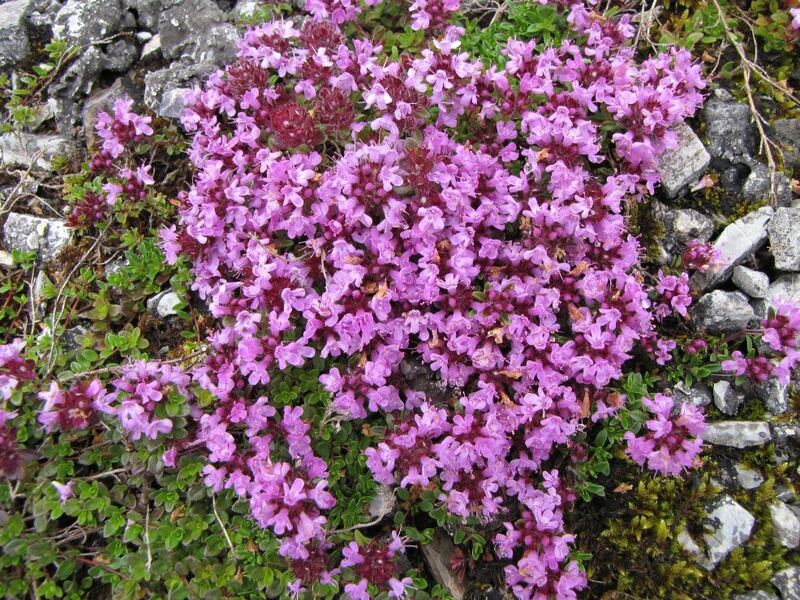 It prefers sunny situations, where the flowers are often buzzing with insect pollinators. Roadsides are a favoured habitat, but tarmac seemed a curious choice, given the tar that binds it together. However, a closer inspection revealed that the rock component of the tarmac was crushed limestone. Creeping around the wild thyme were the runners of mouse-ear hawkweed Pilosella officinarum, another typical plant of well-drained sunny situations. Hawkweeds are notoriously difficult to identify, but this is the exception, with solitary lemon-yellow flowers and leaves that are fringed with long hairs, hence its name, and white-felted beneath.